On the morning of July 3rd, an icon of the School of Design and Visual Arts at Georgian College Barrie Campus entered a new phase of existence. 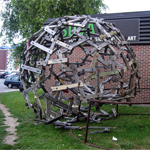 Random Order, created by Fine Art graduate Doug Scholes, was installed on the Barrie campus in 1994 where it quickly became an identifying feature of the arts building. Time and the elements have taken their toll and, after almost twenty years, it became necessary to dismantle the piece. 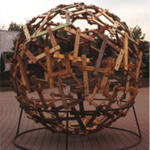 In order to preserve this symbolic sculpture, a select section was cut from the sphere and installed in the garden outside the Helen and Arch Brown Centre for Design and Visual Art. Live via Skype, Doug, who is currently working on another project in the United Kingdom, directed the artist volunteers through the process of transitioning the sculpture. The process was webcast live and the recordings of that webcast have been edited and can be viewed by selecting the links above. Random Order the form, the sphere, was created as harmonious arrangements of haphazardly placed individual elements. Seen as a whole, it reflects an overall form and structure of life, but taken as sections or up close, the system is less evident, lost in the seemingly chaotic assemblage of its parts. Reflecting back, as one tends to do during a transition, as it is for Random Order, I can see the manifestation of my initial intent through the events that have befallen the work over the almost twenty years of its existence. 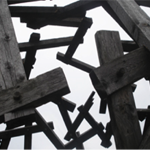 I built the sculpture in the loft of Mike Coughlin’s barn atop the Double Door Studios and Gallery in Anten Mills during the two summers of 1993 and, assisted by John Lipskie, 1994. A twelve-foot diameter sphere allowed just enough room for the sculpture to be lifted and moved by hand through the double doors of the loft. Random Order was installed in the courtyard of the Barrie City Hall, on the spot where the fountain is today, from October 1st to November 6th, 1994. Initially, I intended to remove it from the courtyard before the end of October, and before Mat Night, the eve of Halloween, an evening notorious for random acts of vandalism. I received a week extension from the city of Barrie in order to work out the details of moving the sculpture to the campus of Georgian College. Having remained unscathed for just over a month was no guarantee that it would remain so. On the eve of October 31st it was vandalized, tipped over support and all. The vandalism, although not understood at the time, is the initial act that caused me to consider the positive effect a destructive (as opposed to creative) force has on something. 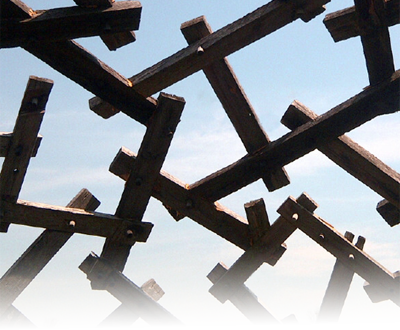 The act of vandalism, the tipping of Random Order, allowed for an unforeseen and unintended perspective and made an everlasting mark on the character of the sculpture. 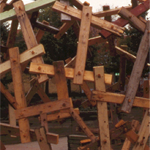 In the fall of 1994, Random Order was installed on the campus of Georgian College in the courtyard outside the School of Design and Visual Arts. 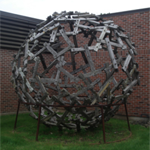 Later, when the SDVA building underwent renovations and improvements, the sculpture was moved to the side entrance near E-Building. It remained virtually unscathed until the winter of 2003 when it was hit by a snow-clearing vehicle, bending the metal base. Although the sculpture was not damaged the base needed to be repaired. Before Random Order could be bolted and secured to the steel support it was hit again. 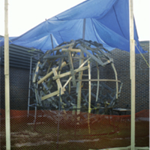 This time the vandals tried to roll the sphere out of its support. By now, the wood had weakened to a point that the structure, when outside its support, could no longer hold its own weight. The resulting extensive damage was to the lower half of the structure. I returned to Barrie to affect the repairs. With the help of the SDVA faculty, staff and students I worked to repair and maintain Random Order during two two-week periods - one in the fall of 2003 and then again in the spring of 2004. The intact top half of Random Order was flipped over and placed back in the metal support. 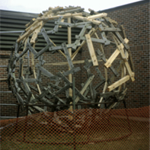 From there, I created a form on which I cut, glued, and screwed the new 2” x 4” sections to (re)complete the sphere. Altered from the attacks of vandalism and from the tests of time, Random Order was given a new lease on life. I brought it back from the brink of destruction and the possibility of removal from the campus. 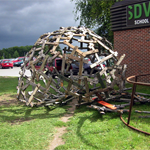 Now, in the summer of 2012, the sphere has become weather worn and weak to the point where the fabric of the wooden structure can no longer support a respectable and safe existence. Random Order will be dismantled on July 3rd, 2012. The event will be broadcast live (on the internet) as I ‘direct’ the procedures from London, UK, where I am currently on residency at SPACE Studios. 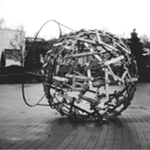 Although removed from its almost two decade location, Random Order will continue to exist on campus through a preserved section of the sculpture placed in the central courtyard garden in front of the School of Design and Visual Arts. The support for Random Order from Georgian College and the School of Design and Visual Arts has been unconditional throughout the years. If not for the interest and energy of Alek Sorotschynski and Ted Fullerton the sculpture would have met a much sooner end, that I am sure. To the council offered by William Moore, the words of support and encouragement enabled in no small way the manifestation of the idea. To Tamara Benoit and Bernice Vasey for their work in preserving the sculpture and in so doing its significance within the community. To Laurie Lamoureux Scholes who, throughout it all, has never let me forget the importance of balance between what I think and what is required. To the friends and colleagues who have generously offered their support over the years, including Greg Amann, Steve Benoit, Tim Bilton, Mike Coughlin, Roy Hickling, Sue Hickling, Peter Koetsier, Wendy Koetsier, Tim Laurin, John Lipskie, Connie Spiegl, Janet Wilson, and others who volunteered in the various stages of creation and re-creation that Random Order has under gone. All photos taken by Doug Scholes except Random Order - Rolled by Tamara Benoit.